An artist's environment is integrally important to an artist's development. Working in a space that is small and cramped isn't ideal, but for a lot of us it's an only option. 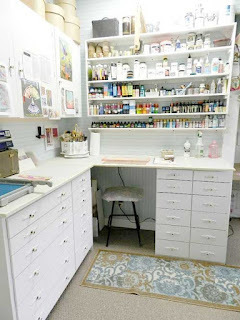 For those tiny areas, these are our top 5 tips for setting up an efficient and clean artist space. 1. Keep everything off the desk. 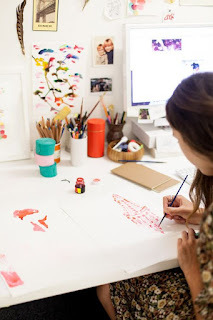 Penguin book designer Arielle Gamble works on illustrations for a new title. Photo - Phu Tang. Well, perhaps not everything. 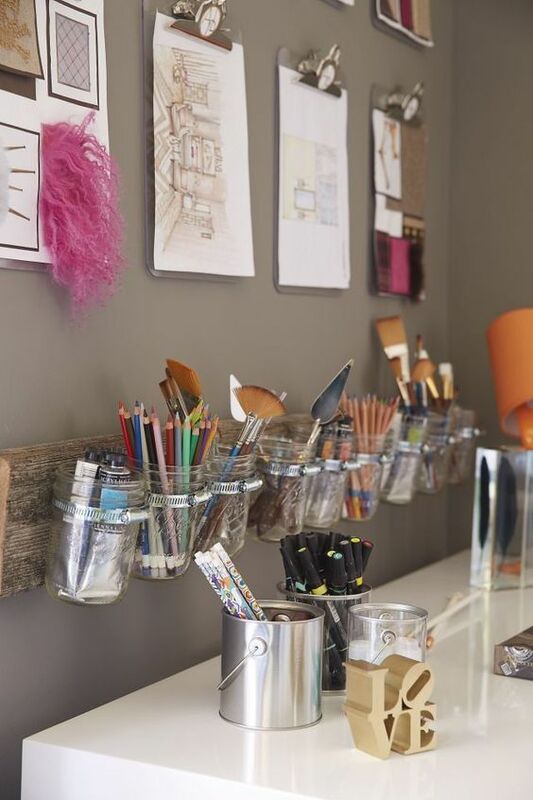 We know your desk will most likely be used to rest your pencils, paintbrushes, charcoal, water, etc. But these necessities aside, it is best to have your items off the table as much as possible, as this helps negate potential accidents from happening. 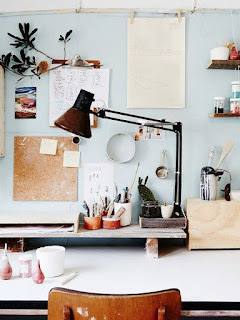 The less items you have on your work space, the less likely a little charcoal thumbprint will stain the back of your work, or that your water jar will tip over when you reach for a paintbrush. This also makes clean-up easier, and prevents cross-contamination when you work from medium to medium. 2. 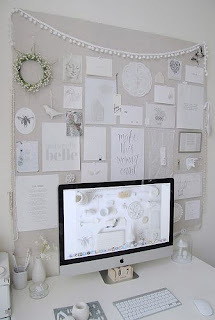 Fill your wall-space wisely. When you're first starting out as an artist, chances are your space will be a bit on the smaller side. While it can be tempting to stack that corner up with shelving, leaving a wall space empty may actually be more beneficial. 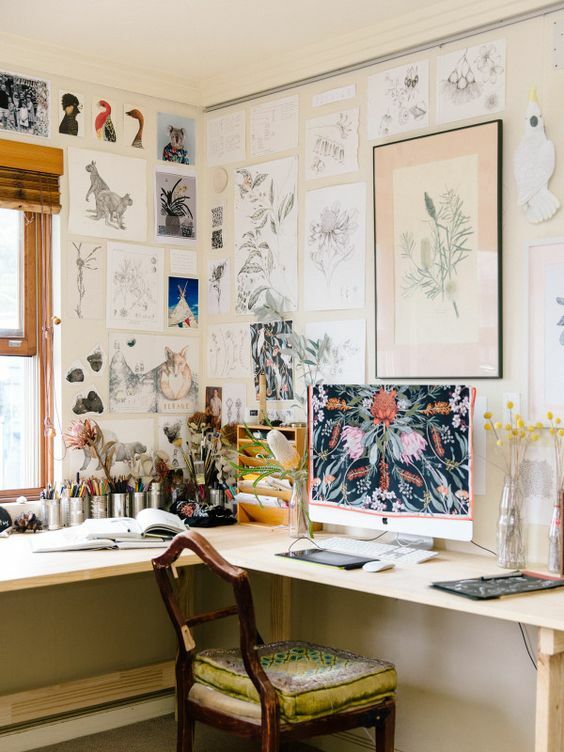 An intentional blank wall space can actually be more inspiring, as it not only breaks up the crowding of towering storage, but it also provides a gallery space for you to hang your work when you are finished. Take time to bask in the pride of your work, the deep satisfactions of a completed piece. Hanging a piece reminds you of your productivity, and keeps your steam going to start a new piece. If not with your own work, a blank wall space also provides an excellent area for brainstorming and iterating. It's a space for visual references and conceptual experimentation, while leaving you and your work surface clean and ready for the final process. 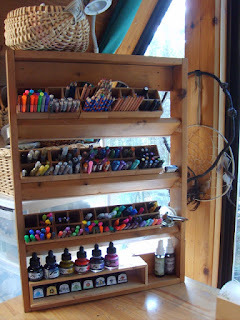 Now that being said, shelving is also immensely important when you have a small space. The trick is to make sure you invest in the right type of shelves for your space, and from our experience, it's better to go up-up-up. If your housing situation allows, invest in shelving brackets and learn how to screw them into the wall - this will keep both your desk clear, and reserve some wall-space for inspiration and brainstorming. If you are renting and are not able to make holes in the walls, no fear! 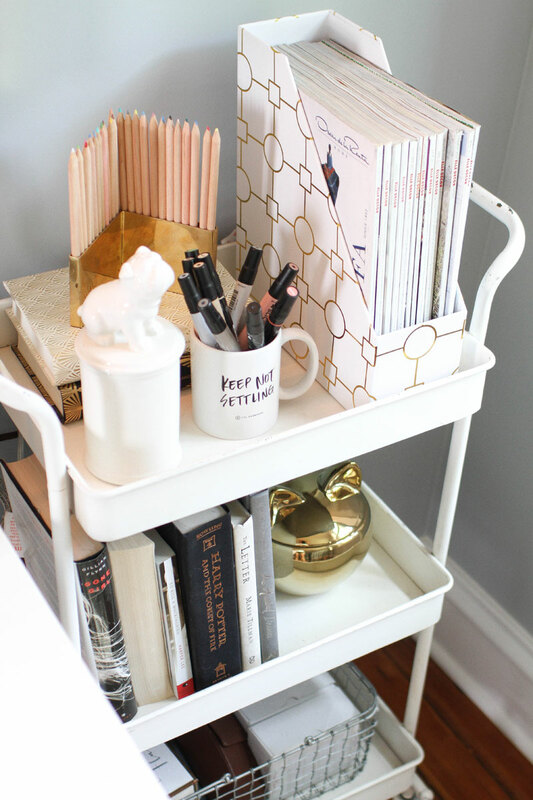 In these scenarios we recommend adding a shelf onto a desk - or better yet, building a desk from a shelf. 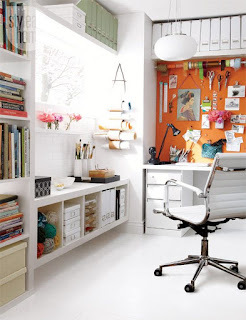 Sliding a desk right up against an adjustable shelf like Ikea's Billy Bookcase still lets you keep your items off the desk, while opening up a bit of much-needed gallery or inspiration wall-space underneath. 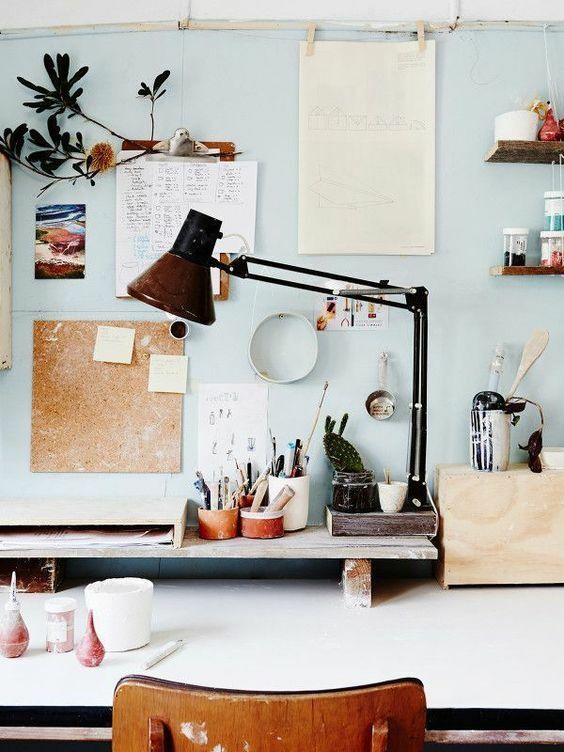 As your art grows, so will your work space. The best way to let both organically grow together is to keep as many components adjustable and movable as possible. 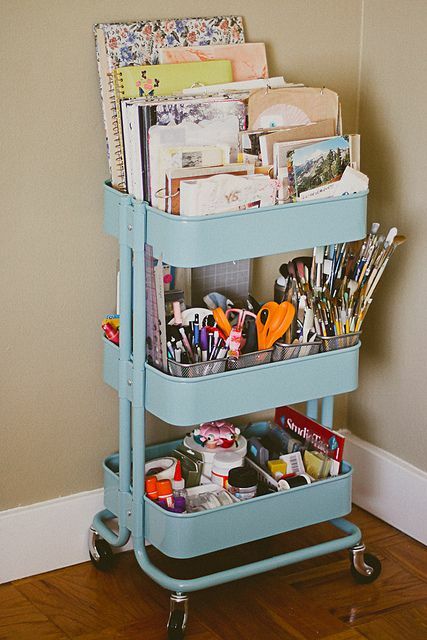 By adding wheels to your furniture pieces and making each piece an isolated component on its own, you will be able to adjust your work space to fit your project, big or small. 5. Be a bit of a Builder Bob. While this may sound like a bit of a stretch outside the art world, I cannot recommend it enough. The best way to ultimately make a space work for you, is to have some ability to build something to your exact need. Having some knowledge of wood types and boards (ie, birch plywood vs mdf) and some basic construction techniques will be of immense help (both to your space and to your pocket!). Once you get going, you may even find that building is actually quite fun, as it just opens up a whole new world of possibilities. So those are our 5 tips!! What did you think? If you have any tips you guys would like to share, let us know in the comments below and we can share them in an upcoming post!